Optional precaution blue texture, safety orange or taupe tan textured power coat finish inside and out over phosphatized surface. Panels are powder coated to match the enclosure. Enclosure: Height=18.00 Width=16.00 Depth=6.00; Tan; includes Sub-Panel. Enclosure: Height=18.00 Width=16.00 Depth=6.00; Blue; includes Sub-Panel. Enclosure: Height=18.00 Width=16.00 Depth=6.00; Orange; Includes Sub-Panel. 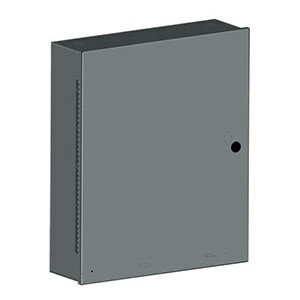 Enclosure: Height=24.00 Width=20.00 Depth=6.00; Tan; includes Sub-Panel. Enclosure: Height=24.00 Width=20.00 Depth=6.00; Blue; includes Sub-Panel. Enclosure: Height=24.00 Width=20.00 Depth=6.00; Orange; includes Sub-Panel. Enclosure: Height=36.00 Width=24.00 Depth=6.00; Tan; includes Sub-Panel. Enclosure: Height=36.00 Width=24.00 Depth=6.00; Blue; includes Sub-Panel. Enclosure: Height=36.00 Width=24.00 Depth=6.00; Orange; includes Sub-Panel.